“Some Desperado” by Joe Abercrombie – An exciting western-flavored story about a woman named Shy (the main character from Abercrombie’s Red Country) running from two bandits. Action-packed and expertly narrated by Stana Katic. “My Heart is Either Broken” by Megan Abbott – Abbott is the author of one of the most terrifying books I’ve ever read that isn’t technically a horror story (The End of Everything), and here she delivers a chilling spin on the Casey Anthony story that is easily one of the best in this anthology. “Nora’s Song” by Cecelia Holland – Historical fiction about Eleanor of Aquitane’s daughter. Well done but ultimately forgettable. “The Hands That Are Not There” by Melinda Snodgrass – The “dangerous” woman is only a supporting character in this story about an adulterous diplomat who begins a relationship with an exotic non-human. Decent enough, but the story’s ideas and plot twists felt unremarkable. “Bombshells” by Jim Butcher (The Dresden Files) – This is a brisk little side story in the Dresden Files universe, hampered only by the fact that it directly follows a major plot twist in the main series. I already knew the twist, so I wasn’t spoiled, but if you’ve somehow remained spoiler-free about the events of book twelve in the series, you might want to skip this one for now. That said, it did feel like a reasonably well done standalone adventure. “Raisa Stepanova” by Carrie Vaughn – Historical fiction about a female Russian fighter pilot in WW2. Worth reading for what feels like a unique perspective on historical events. “Wrestling Jesus” by Joe R. Lansdale – A woman barely features in this story about an elderly former luchador training an apprentice and dealing with a long-simmering rivalry. I liked the story well enough, but the thematic connection was tenuous. “Neighbors” by Megan Lindholm – An elderly woman deals with otherworldly events that might be the signs of oncoming dementia. I haven’t read much speculative fiction that focused on an elderly protagonist, so I really enjoyed this story. “I Know How to Pick ’Em” by Lawrence Block – A disturbing tale about the relationship between a tough guy and a femme fatale paired with a squick-inducing back-story. The main character was a classic noir character done well, but his back-story made this a particularly difficult listen. Hard to stomach. “Shadows for Silence in the Forests of Hell” by Brandon Sanderson (Cosmere) – Sanderson’s excellent touch for world-building combines with a tense and exciting adventure story about a bounty hunter living in a brutal and dangerous world. Although this is technically part of an existing universe, it seems like it has few, if any, connections to Sanderson’s other books. “A Queen in Exile” by Sharon Kay Penman – Historical fiction about the birth of Frederick II. Interesting if a little dry. I felt like I learned something from this story, but I wasn’t that caught up in the characters. “The Girl in the Mirror” by Lev Grossman (The Magicians) – I enjoyed this story, which provides a glimpse of what Quentin Coldwater is up to after the events of The Magician King while also setting up a new supporting character, but it does feel like a pretty direct tie-in to the third book. This probably works more as a preview of The Magician’s Land than a standalone piece. “Second Arabesque, Very Slowly” by Nancy Kress – Nearly feral young survivors in a post-apocalyptic world rediscover the lost art of ballet with the help of their middle-aged nurse. Decent world-building and a compelling main character. “City Lazarus” by Diana Rowland – The story of a corrupt cop in a post-apocalyptic New Orléans. Interesting because of its completely unsympathetic main character and fairly limited speculative elements; lands more as noir than speculative. The female character lurks in the background instead of taking center stage, but Rowland brings it home by the end. “Virgins” by Diana Gabaldon (Outlander) – A prequel to the Outlander books that mostly focuses on the adventures of two male characters. A woman does eventually show up, but feels incidental. Entertaining enough, but it overstayed its welcome a bit after a few false endings. “Hell Hath No Fury” by Sherrilyn Kenyon – The only complete dud in the collection. This is a by-the-numbers horror story about a group of kids who run afoul of an angry Native American ghost. It’s chock full of eyeroll-inducing clichés and wraps up with a particularly leaden bit of moralizing. “Pronouncing Doom” by S. M. Stirling (The Emberverse) – A legal drama set in a post-apocalyptic society that bases its social structures around Celtic clans. Ultimately kind of dull and predictable. “Name the Beast” by Sam Sykes – Fantasy story about monster hunters with an interesting twist. Occasionally confusing thanks to stylistic choices made by the author, but overall fairly well-done. “Caretakers” by Pat Cadigan – The pacing in this story is deadly, and I wasn’t sure where it was going for a very long time. It does eventually arrive at something resembling a narrative, but for the most part it’s just a rehashing of the complicated relationship between two sisters separated by an age difference as they deal with their elderly mother’s Alzheimer’s. “Lies My Mother Told Me” by Caroline Spector (Wild Cards) – A New Orleans-set superhero story about the relationships between mothers and daughters, both good and bad. Definitely made me want to read more stories set in the Wild Cards universe. “The Princess and the Queen, or, the Blacks and the Greens” by George R.R. 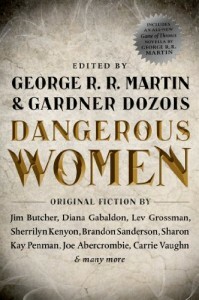 Martin (A Song of Ice and Fire) – To be honest, if you bought Dangerous Women for this story alone, you might end up disappointed. Instead of focusing on a few viewpoint characters, this novella is more of a dry historical summary that follows a huge cast over several years. I had a hard time keeping track of the largely interchangeable characters, and I’m not sure what knowing this history in such detail adds to A Song of Ice and Fire other than hammering home parallels between two massive wars. There is enough plot here for multiple novels but none of it feels crucial because the characters are rarely more than historical footnotes.